Lutsenko says Ukrainian defense ministers have deliberately destroyed army. 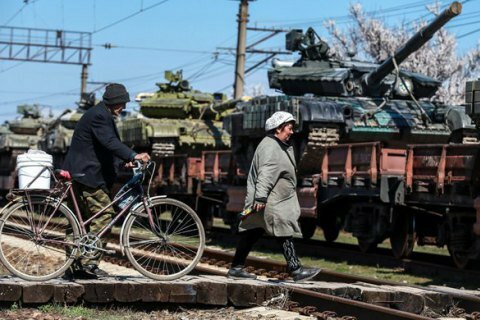 In the period from 2004 to 2015, Ukraine has sold over 830 tanks, 710 combat vehicles and 200 aircraft, the Prosecutor General, Yuriy Lutsenko said at a meeting of the Verkhovna Rada Committee on National Security and Defence on 2 September. According to the chief prosecutor, such a massive sell-off was an element of Russia's military invasion. "After the collapse of the Soviet Union, Ukrainian army has inherited 6011 tanks, 5791 combat vehicles, about 6,500 pieces of artillery, over 1,000 combat aircraft. This is how independent Ukraine with an independent army has emerged. The biggest sales occurred before 2005, but most of the documents have simply been lost or [intentionally] destroyed," Lutsenko said as he reported on the results of the investigation of Russian aggression in eastern Ukraine. Meanwhile, the period from 2005 to 2014 is fully documented. "Over the ten past years, military equipment worth 1.837bn hryvnia has been sold. Of these, the Armed Forces have sold 832 tanks, 232 helicopters, 202 aircraft, 714 infantry fighting vehicles and armored personnel carriers, 4,930 vehicles, 28,555 units of missile and artillery weapons, 1,824 firearms, and ammunition worth 560 million." The sale of property continued under every defense minister, but especially under Mikhailo Yezhel and Yuriy Yekhanurov. "We found sensational materials, which show that the former chiefs of defence would take the full list of all available weapons, which is a top secret document, out of the ministry and work to destroy the combat capability of Ukraine," Lutsenko said.